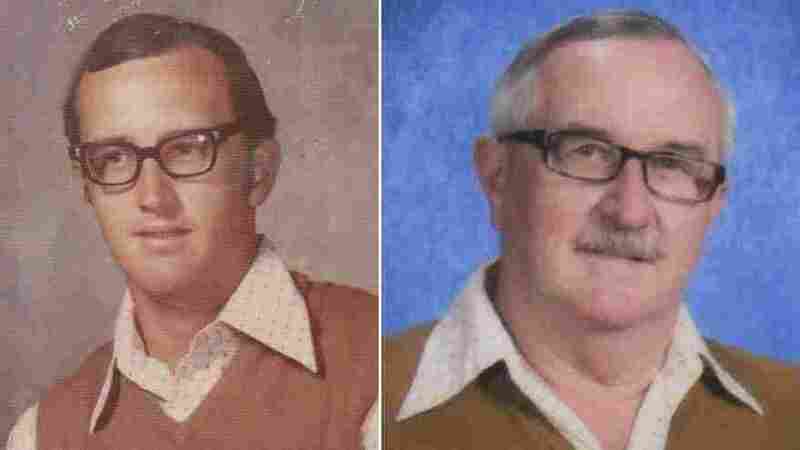 40 Years Of Disco Duds Prove A Teacher Can Be Awesome, Too : The Two-Way In every school photo for the past 40 years, Texas gym teacher Dale Irby wore the same '70s-era sweater vest and wide-collared shirt. It began as a dare and become something much better. We knew our parents were awesome. He proves our teachers were too. Dale Irby in 1973 (left) when his streak began, and in 2012, when the last of his 40 wonderful school photos was taken. Before we explore his awesomeness, though, here's some background. In 1973, Irby's first year as a elementary school coach in the Dallas area, word went out that teachers should "wear something nice" for school photos. He didn't have too many things to choose from at the time. Phys ed teachers, after all, get to wear shorts to work if they wish. He went with the vest and polyester shirt.
" 'I was so embarrassed when I got the school pictures back that second year and realized I had worn the very same thing as the first year,' said Dale, 63. But his wife, Cathy, dared him to do it a third year. Then Dale thought five would be funny. 'After five pictures,' he said, 'it was like: 'Why stop?' "
"So," the Morning News adds, "he just never did, right on through this, his final year as every kid's favorite physical education teacher at Prestonwood Elementary in the Richardson school district" of Dallas. The Morning News put together a slide show and a video that capture Irby's wonderfully wacky timeline. Click through to see how he changed over the years, even as the vest and shirt stayed firmly stuck in the disco days. There's also a blog post from Morning News photographer Gerry McCarthy, who writes that the recently retired Irby tells the Morning News "he was 'shocked' and 'surprised' by all the attention. He doesn't really understand it." We think we might understand it. Which brings us back to that word — awesome. Yes, Your Parents Were 'Awesome'; So Why Not Show The World? As we wrote at the time, "you may not want to admit it. But your parents were probably pretty cool in their day. ... One guy's made it his mission to show the world that our parents were — and are — awesome. Eliot Glazer talked with All Things Considered host Michele Norris about My Parents Were Awesome, the blog he's running." Since that post, My Parents Were Awesome has collected many more photos of parents who "before the fanny packs and Andrea Bocelli concerts ... were once free- wheeling, fashion-forward, and super awesome." It seems clear: There's something great about seeing your elders — whether they be parents, grandparents or teachers — in all their youthful glory. And Irby took things even further. He turned his embarrassment into something ... well, awesome.